Sciblogs | Publish a 'popular science' version of your thesis? Publish a 'popular science' version of your thesis? I know that would be asking students to do even more work (! 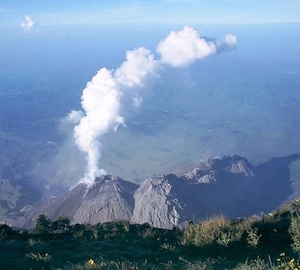 ), but give a gander at Oxford University geologist Jeannie Scott’s ‘for the public’ edition of her Ph.D. thesis on The Santiaguito volcanic dome complex, Guatemala (PDF file – an 8.8 Mb download). … the formation of pairs is probably due to migration of the volcanic arc towards the coast. This migration takes hundreds of thousands of years, so it won’t affect anyone with beachfront property! At the end there are links to further reading on-line (and at the very end, for those wanting a lead the the science, literature references). So then, what about the idea of more students doing this? Hmm, in some ways though this is getting easier with the ways we can store data and information, and disseminate it. I could fit my PhD thesis on a 3.5″ floppy disc, but the technology to sample bits and upload it to the web weren’t absent. I think it’s great when it can be done. They’re a huge effort for the number of eyeballs they get. Of course there are the important eyeballs of the examiners first…!